Many organizations require continuous operation of their mission-critical, IBM® FileNet P8® systems after a failure has occurred. Loss of system resources and services as a result of any failure can translate directly into lost customers and lost revenue. The goal, therefore, is to design and implement a FileNet P8 system that ensures continuous operation even after a failure happens. 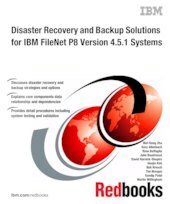 This IBM Redbooks® publication focuses on FileNet P8 Version 4.5.1 systems disaster recovery. The book covers strategies, preparation levels, site sizing, data replication, testing, and what to do during a disaster. Backup and restore planning is a critical aspect of a disaster recovery strategy. We discuss backup types and strategies. We also discuss alternative strategies such as rolling storage policies and IBM FlashCopy® capability. With the help of use cases and our lab testing environment, the book provides guidelines for setting up a FileNet P8 production environment and a standby FileNet P8 disaster recovery system. This book is intended for IT architects, IT specialists, project managers, and decision makers, who must identify the best disaster recovery strategies and integrate them into the FileNet P8 system design process.